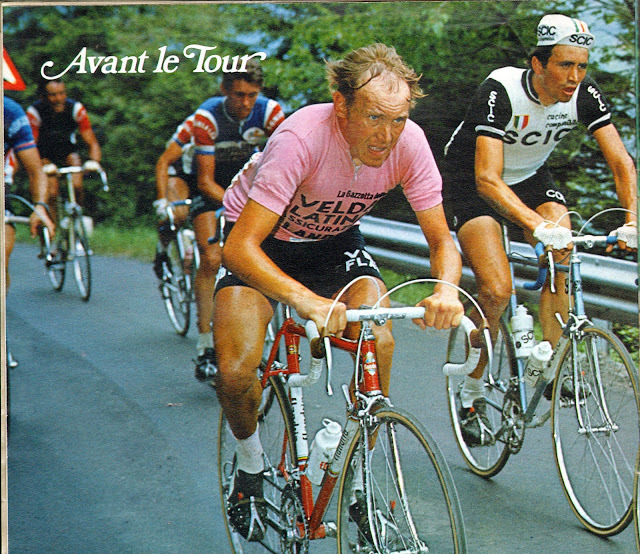 Photo of the day: Pollentier in the '77 Giro. Case in point. Flandria's Michel Pollentier in the '77 Giro. Team leader out with broken wrist, the man from Nieuwport just stepped up and took command. Pollentier may not have looked very good on a bike- sitting sideways, kness sticking out, lots of upper body movement. But he had the fitness and the motor to make the thing go. Some say his success was chemically induced. I'm inclined to believe it came from riding all winter into the wind off the nordzee, and marathon cyclocross sessions in the dunes with Freddy Maertens. 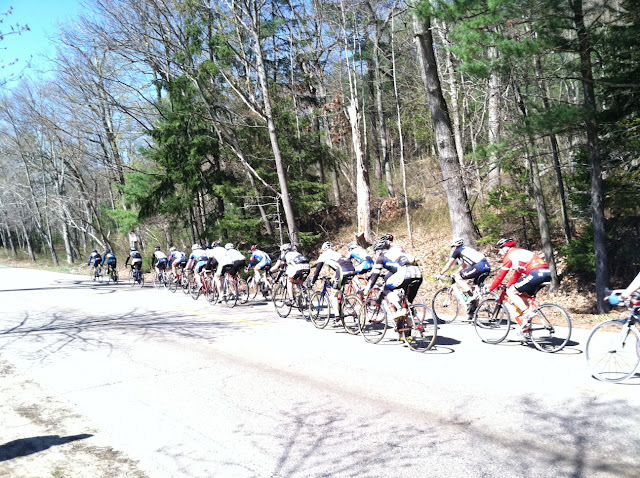 I always liked the Lake Sunapee Road Race. It's a new England classic - a race that's been held since the mid seventies. The 23 mile loop on rolling hills around a beautiful New Hampshire lake is a superbe venue for a race, and the Lake Sunapee bicycle club that puts it on does a great job. The race used to be a fixture at the end of August, where it served as the New England Road Racing championships. Now it's held mid-May, but still gets a good turnout. Let's meet the guys! Front seat, well, that's for the leaders: From left, three time (53,54, 55) winner Louison Bobet (back after missing the Tour for a few years) Jacques Anquetil (the 57 winner), D.S. Marcel Bidot, Andre Darrigade (multi green jersey winning sprinter). 2nd Row: Roger Walkowiak ('56 winner, still getting 2nd billing and no respect), Louis Bergaud, Francis Pipelin, Jean Stablinski. 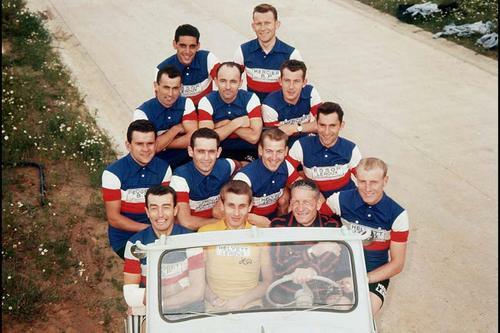 3rd row: Joseph Groussard, Gilbert Bauvin (2nd in 56), Rene Privat. 4th row: Jean Forestier, Francois Mahe. Today was an ice cold shower. A reminder of just how dangerous our sport can be. Wouter Weylants is overleden. Tragic. There's not much more I can say. 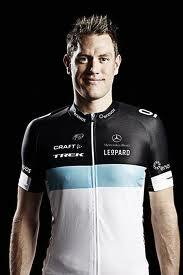 I'm embarrassed to admit I didn't really know much about Wouter's career. I don't know much more than the fact that he was a great, selfless teammate of Tommeke on Quick Step for many years, a man who could win sprints himself when let loose to do so. I knew he'd joined Leopard Trek this year. And that he was a man who always seemed to have a smile on his face. I just finished watching a distraught Michel Wuyts and Karl Vannieuwekere on Sporza paying tributes. Both guys - my favorite commentators -are real enthusiasts who live for the sport. Both looked a little in shock and pain. I don't have words suitable, but read Johan Bruyneel's blog post here. He puts it perfectly I think. 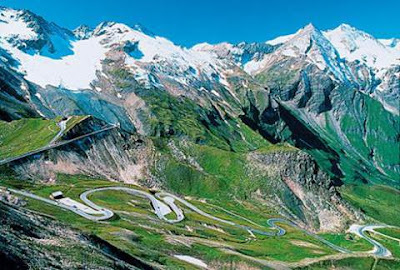 Grossglockner, the Giro and Gaul. The Giro d'Italia this year looks like it's going to be one of the hardest editions in recent memory. Angelo Zomegnan and co. have put together a route seemingly with more killer climbs than any Grand Tour in recent memory. That's what I was today wielersupporters. Unabashed pack fill, but happy to finally see the finish of a race in the main group. That should get an asterisk though. After all, the 42 mile Blue Hills road race isn't exactly what one would call 'selective'... a nice seven mile circuit around the Blue Hill reservation just outside Boston, with a winding, moderately uphill finish. Big ring all the way around. Sprinters race, fast. Still, I'm satisfied with being pack filler today - a concept that goes against the grain for me.